No one found that clue, but otherwise, we have winners and a new scoreboard. I am mystified that none of the quests in the five eggs that were located have been done. 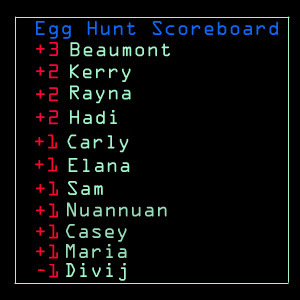 As for the online egg-hunt. The Haikus came in with ferocity, and all of them followed the 5-7-5 rhythm for the poems. All of them were very creative and made me laugh, so all our haiku writers got an extra point. I suppose Cline was being ironic, and Wade is a horny teenaged boy who has really fallen hard for Art3mis. But that cheese-factor here earns five wedges of Gorgonzola. The mood of the house of the fall of usher is definitely a mood of suspenseful caveat. From the beginning of the stories description of the house being decrepit, just barely holding itself together, the story is being set up for the house to crumble. Also the fact that the story begins with Roderick in a similar state as the house (mentally and physically) from the start, the reader knows that Roderick is unstable, and that he’s going to go over the edge at some point in time during the story, we just don’t know exactly when. Also the story of the dragon at the end is a definite give-away of the suspenseful nature of this story. As he reads the book, all of the actions and sounds from the story play out, but slowly. First he hears a sound, but he’s unsure if he made it up or not, then the situation escalates to Roderick speaking to himself and the door being banged down, and then Madelyn finally coming in. these are all very suspenseful parts of a very suspenseful tail, and the warning in the story is unclear, but I feel that it is definitely foreboding of something. Good job, Gunters. Now on to my swan-song teaching with Second Life's simulation of Usher, for the foreseeable future. Traditional papers are a lot less work, but not nearly as fun.